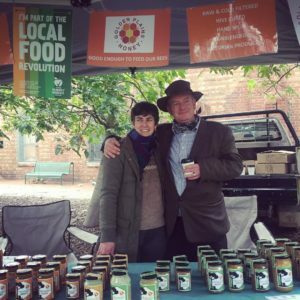 Golden Plains Honey is located in the small town of Teesdale in Central Victoria, about one and a half hours from central Melbourne. It is a family owned small business. We produce 100 % Raw & Cold Filtered Honey. No heat applied during extraction or processing. Honey is fully matured and cured in the hive. All hives are sourced from sustainable Australian timber. Our hive boxes our chemical free. Bio dynamic principles of bee keeping have been adopted, as permissible under current legislation. Hive design innovations ensure intervention is kept to a minimum, thereby ensuring optimal conditions for the bees, maximising bee health. We do not artificially breed queens or use artificially inseminated queens. Queen cells are taken from hives when possible to create new hives. We offer free bee rescue service, relocating swarms to safe quarantine sites before relocating in regional Victoria, free training and advice to hobby bee keepers, “Hive Management Service’, ‘Adopt A Bee Hive’ programme and ‘Hives For Lease’ program. We are careful not to let our hives be put near huge mono cultures. Work closely with local farmers to promote bee health and bee friendly practices. We are working towards Bio Dynamic certification in the short term. Mark Colley is the founder of BeeSaviours, and head beekeeper at Golden Plains Honey. Its purpose is to conserve bees—not only honey bees but indigenous pollinators as well. The inspiration arose from my childhood experience of beekeeping in England, coupled with a love of nature. ‘Nicknamed ‘Insect’ as a young lad, his interest in the natural world has played a major part in his current awareness and activism. I read extensively on ecological matters. My childhood heroes were Rachael Carson (author of Silent Spring), Edward O Wilson (author of Biophilia) and David Attenborough. Having a fascination with honey bees, I became aware of the global issues concerning bees and the increasing battle with most farming techniques, most notably the increased use of ever stronger pesticide. To take action, we undertook a research and development project. We qualified for an R&D grant and have gifted the Intellectual property to a Canadian University, out of which three exciting developments have emerged. We are annually increasing the number of honey bees in various communities, following biodynamic principles. These bees produce a quality honey. Excitingly, we are getting enquires for export to Japan, Norway and China. We are actively working with six farms on incorporating new methodologies in terms of farming for bees. We’ll be encouraging farmers to plant native flowers either side of windbreaks and we’ll be placing bees in five sites this year. We’re also raising trees—Leucospermum (Proteas)—to give to those farmers to help them create a bee-friendly environment.